Someone needs credit for this map--I only posted it. Garrison Ward Key is needed to access this area. Access is at the Expulsion Chamber bonfire, which is behind a locked door. Where three hollows and one Rampart Golem are at outer wall. There is a bonfire and a coffin that takes player to the area. 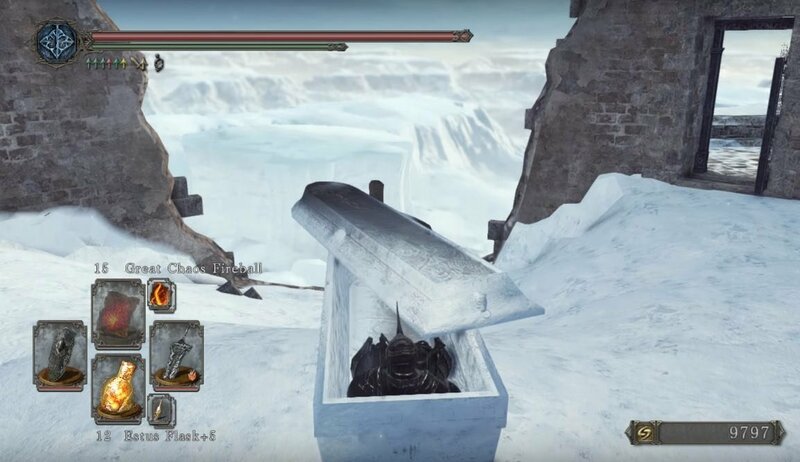 Reaching the Frigid Outskirts is as simple as heading over to the ___ Bonfire and just behind it, there's a coffin. Examining it will make your character jump into it and slide off of the cliff. You'll emerge in an area with a recurring blizzard, as well as the constant Frozen Reindeer spawning throughout the area, making navigation in this area extremely difficult even with the help of Prism Stones. 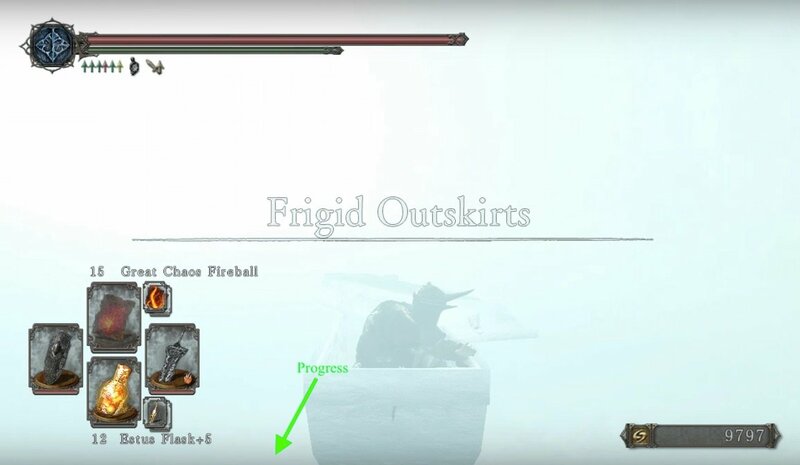 When exiting the coffin, head southwest from where the camera is initially angled to arrive at a summoning circle area, where you can summon Head of Vengaarl, and Abbess Teeva. TIP: When traversing between structures and ruins, you'll always be able to see the next one in the distance. Once you set off for it, it is very important that you make a beeline for it, without falling off-track. This is because the blizzard will return as soon as you leave the summoning circle, and will block your visibility of the path ahead. There are three buildings throughout the map with some loot. The second building to the boss contains a healing spring activated by a Pharros Lockstone. This is especially useful for healing NPC phantoms; although, you have to get them to stand down in the water. They have a mind of their own, but getting them to lock on to you helps: you can herd them into the area, as you may have done to the Barrel Carriers in the Crown of the Old Iron King. When you arrive at the third structure, you'll have to pass through a very short valley to reach a thin, icy bridge. 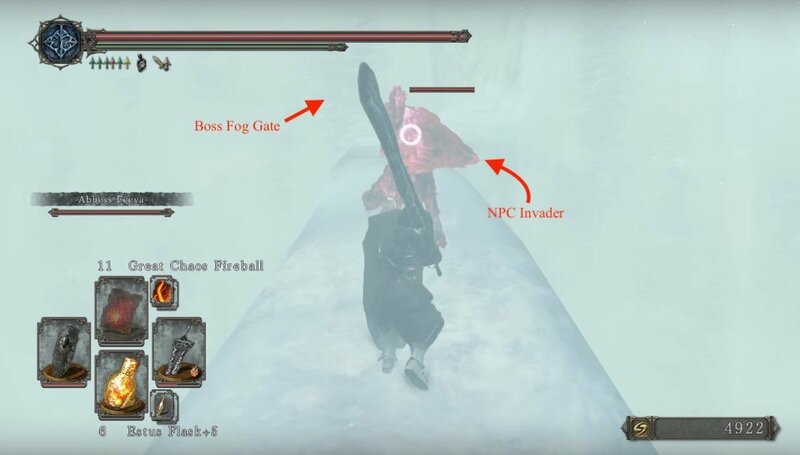 On the other side is a fog gate to the boss encounter. However, you'll have to defeat a large Lance-wielding NPC invader, halfway through the bridge, in order to get to the gate. Avoid getting knocked off of this thin bridge; His lance has the ability to break your stance, or that of your NPC companions. Once you've defeated him, continue forward and take on the bosses of the Frigid Outskirts. Once they have been defeated, you'll receive the Soul of Lud and Zallen. Head through the doorway ahead and continue forward, until you reach a thin beam of light. Examine it to return to the bonfire by the coffin, in Frozen Eleum Loyce. Basically there are 3 areas throughout the map where the horses will appear: 1) past the first ruin, 2) past the second ruin, 3) between the third ruin and the bridge to the fog gate. It doesn't matter where you are in that area, they will always spawn near you. If you wipe out all the horses, they won't respawn after dying or leaving the area. The horses have a small chance (like 5%) of dropping a Petrified Dragon Bone. Pass through this area can be hard, you just have to know one thing. The sun (the reflex that blinds you when is directly on your sight) is your guide; starting from the statues where you can summon phantoms, just follow the sun having it slightly to your right hand (at some point you will reach a wall, go forward close to it), following it will lead you to the right corner of the map (doesn't matter if you get lost, just find the sun and follow it), where the boxes and barrels mark the limit between you and the cliff; and there you go, follow the boxes (in the path there is a corpse with the ring of the living), turn to the right when you see the path to the fog gate (All the enemies will follow you to the fog gate, so be quick or kill them in the way). 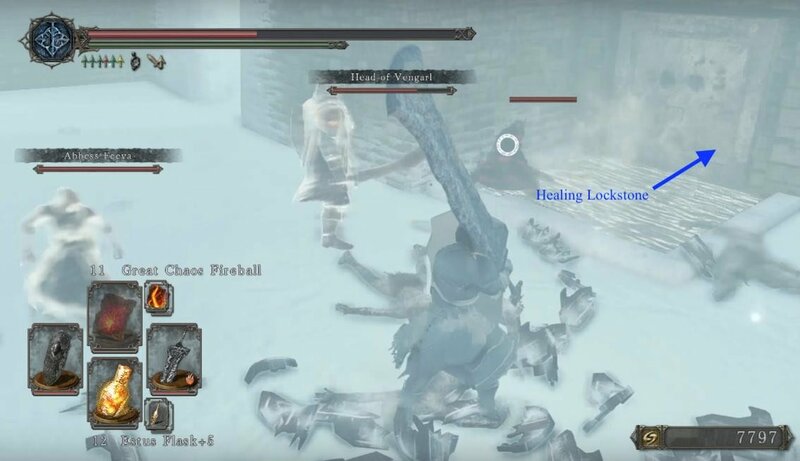 Also you can summon the phantoms for a little help, most of the times they will make it with full health. Running to the Head of Vengarl and then moving in a straight linear path to across the area may be most effective. Vengarl will take aggro from some of the enemies and you don't waste time and on some cases hardly any health. Once you've made to the cliff, its the home stretch to the boss. You can wait for Vengarl (at the risk of enemies following you across the bridge) or go in and start the fight til he gets there. 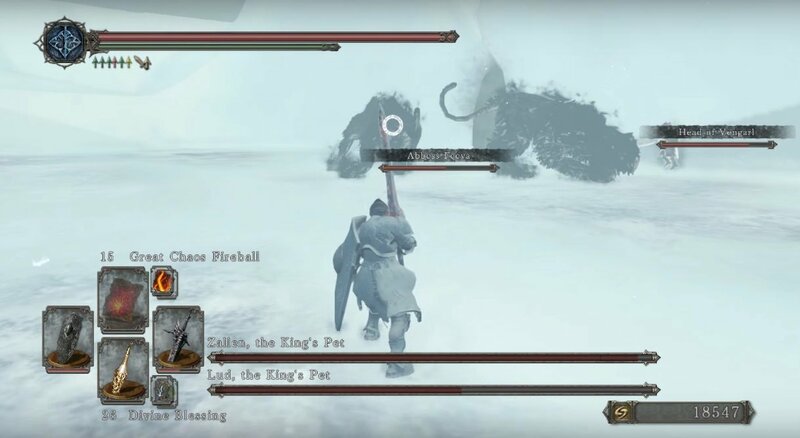 However, if Vengarl's health drops too low, or he dies, head back to the bonfire, due to the fact that the bosses will be stronger and you will have no support. Or simply find a friend to summon with. It is possible to pass through this area in complete stealth without fighting anything. This is achieved by using chameleon/silver talismans to transform into an object, as such the horses will not aggro when the blizzard causes them to spawn so long as you stand still when the storm kicks up. They also don't seem to aggro if you move as slow as physically possible and keep a respectable distance from them, but be careful not to bump into freshly spawned ones in the blizzard and keep your distance from the roaming hollows, they tend to bump into you as they wander around. Warning: this method is painfully slow.